Chessed is an integral part of our programming, as well as a core value we instill within our talmidim. In addition to our Chessed Committees, which coordinate a variety of chessed initiatives for all grades throughout the year, each Shiur has the opportunity to participate in special chessed projects. 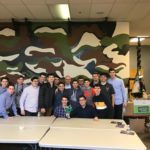 Talmidim in Rabbi Richter’s Junior Shiur visited Koshertroops on Monday, November 12th, where they prepared Shabbos care packages for Jewish soldiers stationed throughout the US, to help them feel connected to the Jewish community while they are away from home. Talmidim added personal messages to their care packages, thanking our troops for their service.